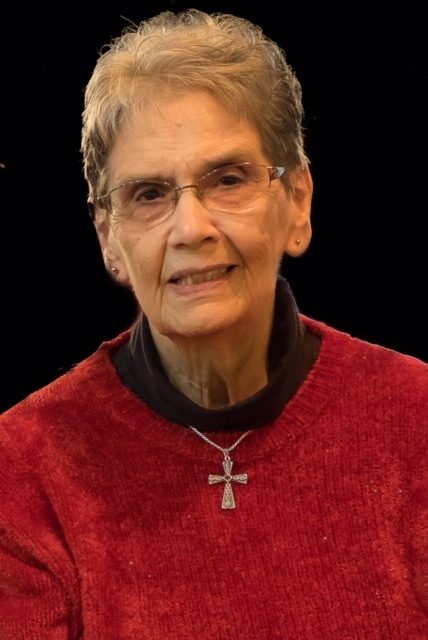 NORWAY — Kathleen (“Kath”) Julia Opolka, 85, passed away surrounded by her loving family on April 12, 2019, in the Memory Care Unit at Evergreen Assisted Living in Kingsford. She was born on July 18, 1933, in Kingsford, the daughter of the late Joseph and Genevieve (Boncher) Bouffiou, and was the youngest of 11 children. She married Henry Opolka on October 6, 1956, at St. Mary Queen of Peace Church. They made their home in Norway “on the Hill” where they raised their six children. Henry preceded her in death on Nov. 28, 2018. They were both members of St. Marys Catholic Church in Norway. Kathleen graduated from Kingsford High School and then worked at Dickinson County Memorial Hospital as an x-ray technician. In addition to being a homemaker, Kathleen worked at the Ben Franklin and Coast-to-Coast stores in Norway. Kathleen’s passion was her family and spending time with them. Some of those favorite times included Christmas shopping with her daughters, camp cookouts at the Waucedah Hilton, going to her grandchildren’s sporting events, hosting 4th of July fireworks, family reunions at City Park, road trips with her sisters to Seattle, and watching sports on television with Henry, especially the Green Bay Packers. Kathleen enjoyed sewing and making crafts and was known for her excellent potato salad. She loved the color red, sunsets, the taste of fresh tomatoes with salt and the sounds of planes overhead as they brought back fond memories of her childhood. Throughout her life and during her time at Evergreen, Kathleen touched many lives with her concern and care for those around her, always maintaining her sense of humor and bringing a smile to those she met. She was a nurturing presence to others and always had a warm welcome for anyone who came through the door. The family wishes to thank the compassionate Evergreen staff and Hospice for the care and devotion shown to both of their parents. Kathleen is survived by her six children, Mary Jean (Bernie) Larson, John (Sherri) Opolka, Kathy (Neal) Johnson, Janice (Jim) Heipel, Douglas (Joan) Opolka, Karen (Tyler) Stoner; grandchildren, Al Larson, Jim (Christina) Larson, Katie (Rick) Wright, Kimberly (Derek) Seilbach, Eric Opolka, Zachery Johnson, Zachary Heipel, Joseph and Angela Opolka and Jacob and Jorden Stoner; great-grandchildren, Henry, Emma, Olivia, Kylie, Isaiah, Kayla, Ava, Axel, Jace, Alivia and Logan. She is also survived by her sister, Elaine Beyer; sister-in-law, Irene Opolka; and many nieces and nephews. She was preceded in death by her brothers, Elwood “Buff” Bouffiou, Joseph Bouffiou, Donald Bouffiou and Eugene Bouffiou; and her sisters, Evelyn Hosking, Beverly Hosking, Shirley Pancheri, Dorothy Calo and Donna Olson. Visitation will be from 9:30 to 11:30 a.m. Wednesday, April 17 at St. Marys Church in Norway. A memorial mass will be celebrated at 11:30 a.m. Wednesday at the church, with Fr. Timothy Ekaitis celebrating. Interment for both Henry and Kathleen will follow at the Norway Township Cemetery. Condolences to the family of Kathleen Opolka may be expressed online at www.ortmanfuneralhome.com. Arrangements have been made with the Ortman Funeral Home in Norway.